John Deere Toys on Sale | Prices as low as $5.65! Home / Deals / Online Deals / Toy Deals / John Deere Toys on Sale | Prices as low as $5.65! Wow, John Deere Toys on Sale and prices as low as $5.65! Now that is a great sale on John Deere toys at Walmart. 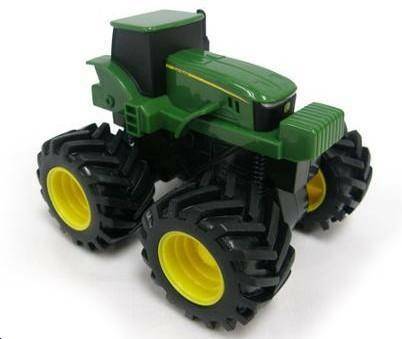 These John Deere toys are great for the little farmer in your family. Plus, you can get Free Store Pick up or Free Shipping on orders of $50 or more. John Deere toys are so much fun to play with look so much like the real tractors. Here are a few of the toys you can find. The John Deere Rev Rumble Tractor is $5.65 was $10.00. The John Deere Tractor with Wagon Play Set is $10.39 was $19.97. And Don’t forget to check out all of the Walmart Deals going on this week! Cheap Disney Princess Dresses for Girls | Only $9 each!